A Sunday newspaper, originally launched to report the grim news from the Great War’s opening exchanges, has celebrated its 100th birthday. The Sunday Post marked the milestone with a free souvenir special which tells the extraordinary history of a publication, dubbed the ‘most successful weekly newspaper in the world’. Owners D C Thomson brought out a 96-page centenary magazine with yesterday’s edition reflecting the way the Post has evolved into a riveting fun-filled mix of news, short features, sentimental stories and classic comic strips. The birthday issue included iconic front pages plus pictures and heart-warming tales from every decade of a newspaper which once boasted up to three million readers – and still circulates throughout its Scottish heartland as well as Northern Ireland and parts of northern England. 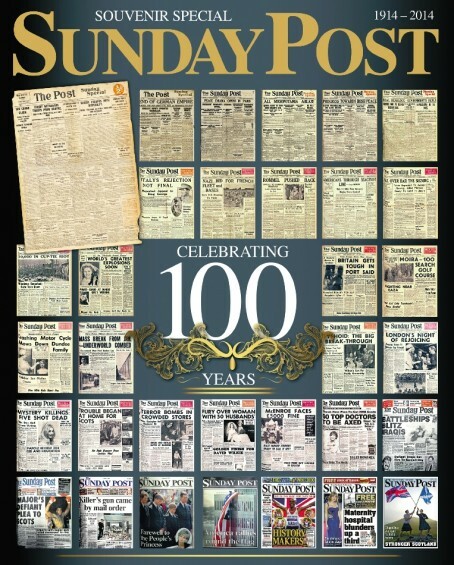 Editor-in-chief Donald Martin said: “We are very proud to celebrate 100 years of The Sunday Post. The Sunday Post, first published just weeks after the outbreak of World War One, continued when global hostilities ended in 1918. Mention the Sunday Post today and what immediately springs to mind for most readers are two comic strips – The Broons and Oor Wullie. These first appeared in the 1930s and have continued until the present day. Like the Simpsons, the cartoon characters remain the same age no matter what year the paper is published in. The souvenir issue contained archive material of The Broons and Oor Wullie; a page dedicated to the comic strips’ guest stars, from Sir Alex Ferguson and Andy Murray to Alex Salmond and Gordon Brown; alongside a reprint of the first ever ‘Fun Section’. “Our special souvenir edition includes the paper’s take on everything from the millennium to Churchill and the moon landings, Maggie Broon’s wedding to Oor Wullie’s brother – and everything in between,” added the paper’s 21st century editorial chief. “The supplement is a wonderful walk down memory lane and really is 96 pages you won’t want to miss,” said Donald. Last weekend saw the paper’s special birthday featured in a BBC Scotland documentary called A Century of Scottish Sundays: 100 Years of the Sunday Post. While The Sunday Post has an office in Glasgow – and DC Thomson is the last newspaper publisher to have a major presence on Fleet Street –the filming centred on the city of its birth, Dundee. The programme included commentary from two of its famous columnists –Lorraine Kelly and Lesley Riddoch –and some extraordinary footage about the company from 1911 that was commissioned by David Coupar Thomson himself, a very early example of corporate video. In the 1950s, when the newspaper was confined largely to Scotland, sales of the Post were so high that it was recorded in the Guinness Book of Records as the newspaper with the highest per capita readership penetration of anywhere in the world. It has seen a slow decline, in 1999 having circulation of 700,000, dropping to 158,059 in the latest ABC figures. Next Sunday (Oct 12) the paper will launch a new magazine supplement, In10. The 48-page lifestyle magazine has been created around the idea of top 10s. Reflecting the busy lives of its readers, the publication’s new addition is full of ideas for ‘living the life you love’. The magazine will feature an Entertainment and What’s On section, Food, Homes and Gardens, Travel, Days Out, Celebrity, Shopping and TV. That’s a bit of a shocker – Oor Wullie’s brother is a baby! More seriously, what a great supplement it was: packed with plenty of memory lane stuff, and a lovely timeline at the bottom of pages which will be useful for my bairn’s history projects. A lot of love and care went into that. The Sunday Post is a great read and has been for the 30 years I’ve been glued to it. Just love the pull-out fun section too. Hello. I am hoping that you can help me with my request. My aunt was recently in hospital and was so upset that she missed the 100th Anniversay of the Sunday Post, she is 83 years of age and very rarely misses buying her favourite Sunday paper. I have made this my mission to try and locate a copy for her. I am unsure if this is indeed the correct page I should be contacting as I only searched Google and will try whoever it takes. If I am in the wrong place for this, would you be kind enough to suggest who I can contact to try and retrieve a copy of this paper for my much loved Aunt. Obviously I am happy to pay any cost involved for Special Edition of this paper and postage and package. Many thanks for your time and hope you can help or assist me with my request.